Today, when you order "Ted Lesley's Cabaret Mindreading & Cabaret Magic Set", you'll instantly be emailed a Penguin Magic gift certificate. You can spend it on anything you like at Penguin, just like cash. Just complete your order as normal, and within seconds you'll get an email with your gift certificate. 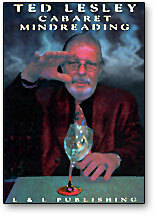 Ted Lesley's Cabaret Mindreading & Cabaret Magic Set (DVD) A living legend of magic finally shares his very best...with you! For the first time ever on video, here's your chance to see Germany's legendary master of magic and mentalism, Ted Lesley, mesmerize a studio audience with his "paramiracles." Then, go behind the scenes and learn the real secrets as Ted,along with well-known magic consultant Charles Reynolds, explains everything you need to know in minute detail. This is the material that has made Ted Lesley a legend in two arenas of the conjuring arts, and now it can be yours! The Spectator as Mindreader ï¿½ A baffling effect that finds the spectator locating the card the performer merely thought of. The Working Performerï¿½s Card Stab ï¿½ A card is signed on its back and shuffled into the pack. The cards are scattered face up as the performer thrusts a dagger through oneï¿½which is found to be the one previously selected and signed. Tossed-Out Deck ï¿½ Wonderful touches on David Hoyï¿½s mentalism classic. Five spectators merely peek at a card yet the performer flawlessly names them all. Black Magic III ï¿½ A great Bank Night effect as a spectator successfully finds a drawing placed into an envelope and mixed with three others. Unfortunately, she manages to miss out on the currency contained in the others! Booktest ï¿½ The performer divines a word freely selected from an ordinary paperback book. Even more amazingly, the performer then correctly identifies a word the spectator draws out of thin air. Pro-monition ï¿½ A spectator is asked to think of a card, which is found to be the only one missing from the deck. The performer then has a spectator remove the selected card from his pocket. Center Tear ï¿½ Great work on one of mentalismï¿½s most powerful tools. Mastery of this technique will give you the ability to read minds any time, any place. Teleportation ï¿½ A page is selected from a book by one spectator while an empty envelope is given to another. On the performerï¿½s command, a piece of the selected page vanishes and is found in the envelope. When compared, the piece fits exactly! Decisions! Decisions! ï¿½ A powerful version of the classic ï¿½Stop!ï¿½ trick. The performer selects a card and places it into an envelope. Cards are then dealt fairly from another deck until a spectator calls ï¿½stop.ï¿½ Though itï¿½s a completely fair choice, the designated card is found to match the one in the envelope. Super Force ï¿½ Through the performerï¿½s apparent mental powers, one spectator locates another spectatorï¿½s chosen card under impossible conditions. Bending Wine Glass ï¿½ Forget spoons! The performer causes a wine glass to visibly bend at the stem though he is nowhere near it. Whatï¿½s more, he also causes two other glasses to bendï¿½while spectators are holding them! Six Card Repeat ï¿½ An ultra-easy version of this magical classic with a surprise ending guaranteed to fool even those in the know! Borrowed Bill in Borrowed Cigarette ï¿½ One half of a borrowed bill is discovered in a truly impossible place ï¿½ inside a cigarette that was also borrowed! Comedy Rope Trick ï¿½ The Professorï¿½s Nightmare turned on its head! A length of rope is clearly cut into three equal pieces yet the pieces are shown to be three different lengths. They become equal yet again and one piece is thrown into the audience. The other two are tied together and then instantly restored into a single length ï¿½ which may be examined! Comedy Mindreading ï¿½ Three playing cards are selected and, after several vain but amusing attempts to find them, the performer finally locates each in increasingly amazing and impossible ways. The Fastest Card Trick in the World ï¿½ Donï¿½t blink as a signed playing card and a borrowed credit card make an impossible journey. Coin Through Sleeves ï¿½ A most-magical version of the classic Winged Silver as a coin mysteriously travels from one hand, up the performerï¿½s sleeve, across his shoulders and into a glass held in the other hand. As a finale, the performer explains the processï¿½using milk! Bill in Lightbulb ï¿½ A borrowed bill is torn in half. One half is vanished and travels into the most unlikely of placesï¿½the center of an ordinary light bulb that was burning brightly just moments before! Bill in Lemon ï¿½ If you think you know this one, you havenï¿½t seen the Lesley version. Again, one half of a borrowed bill vanishes from an envelope held by a spectator and is found inside a lemon that was in plain sight throughout. This DVD is some of Ted Lesley's priceless magic he has been performing for years. Classic magic at it's best for a stage/stand-up show. I learned from this DVD how to properly set up and handle to present my Card Sword on stage. His Bill in Light Bulb is another classic that I learned new and additional ways to use my Milk in Light Bulb lamp. If you are currently using or have one of these prop setting on a shelf because you can't work out a detail, then this is the DVD to purchase to solve many of the questions you may have. I am so happy that Ted Lesley put out this material, as it was just the information I needed introduce these classic effects into my act. Highly Recommended! The tricks are nice, but most of them require gimmicks or a non straight deck. 2 tricks even require a very special type of deck which can only be bought in stores. None of these tricks can be done using just a plain ordinary deck. If you are willing to do the extra work involved the tricks seem amazing, but I would recommend just buying the Max Maven Videomind series which was fantastic. This video won't teach you that much magic that you can do, about 85 percent of the tricks he does are gimmicks. The credit card and card transportation is great for restaurant workers (you borrow someone's credit card and put it in your pocket, then someone has a free choice from a deck of cards and signs one card. You then take an envelope out of you blazer pocket that is sealed, rip it open and the spectator finds both the cards in it). This and the four envelope trick (spectaor picks the one with a joker/pisture in it they win five dollars for it, but there's a ten, a twenty and a one hundred in the other ones) are the only ones I use from these tapes. These video tapes would only be worth it if you already had all the gimmicks and you wanted performance tips.